Our Quarantine Wash Bay facilities based at our yard in Perth WA, are fully licensed and accredited by the Australian Quarantine Inspection Service (AQIS) in Classes 2 to 8. We offer comprehensive washing services to all forms of equipment in the Mining, Agricultural and Commercial sectors at a competitve rate. 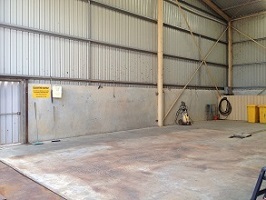 The SWANTRAX Quarantine Wash bays can accept, clean and clear imported vehicles, trucks, plant and equipment. For example, if you are importing a Track Loader or perhaps a dozer bucket from Kazakhstan coming in through Fremantle Port, we are the people you want to see.